Butte, Montana. When I found out that this was to be the home base for a week long work trip my mind automatically moved to the location's fishing potential. Then my fingers quickly navigated through the world wide web to find possibilities. Friends, acquaintances, and people I didn't even know volunteered information. Ivan from over at YGF was particularly helpful. Thanks again to all who helped. 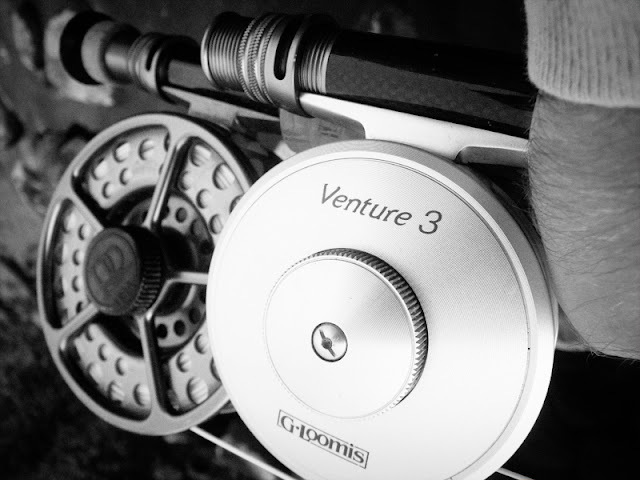 Fishing new waters is always daunting, especially when you have no foundation to start from for a particular area. Late Wednesday afternoon I rolled into town at the trusty Super 8. The next few days I wasn't sure how much time I would have to get out and fish so I refrained from getting a license until my day off. I should have picked one up right away because I could have fished all but one day, at least in the evenings. Half way through the work trip my day off finally arrived. I should have been on the water just as dawn approached but I was too lazy to get out of bed! It wasn't until 11am that I started to pull my things together. I picked up some food, a four day license, and then made my way to the Big Hole River. I put on my boots, buff, lanyard, and then rigged up my 8wt BVK. I put on a mini black streamer, feeling maybe a bit overconfident considering the fact that is was a very hot, sunny day. I started to hoof it upriver to get a ways away from the bridge and the more fished water. I thought I was strong but when the first good riffle came into view, my constitution weakened and the next thing I knew my fly was splashing on the water. Right away a decent fish chased! This was a good sign, and may have unduly padded the overconfidence. After a while had passed with no more chases or bumps I decided to tie on a hot wired hares ear dropper and began to run the streamer through runs as more of a nymph. This produced a couple hooked fish, but they quickly came off. A thunderstorm began rolling in, and lightening scares the bejeebers out of me, so I began working back down river following another fork that led to another bridge. By now I had succumbed to the realization that nymphing would be the ticket for this afternoon. The water was WARM. I traded my streamer for a tandem nymph rig and right away picked up this little beaut of a brown. It was my first ever landed Montana fish, caught on the fly. 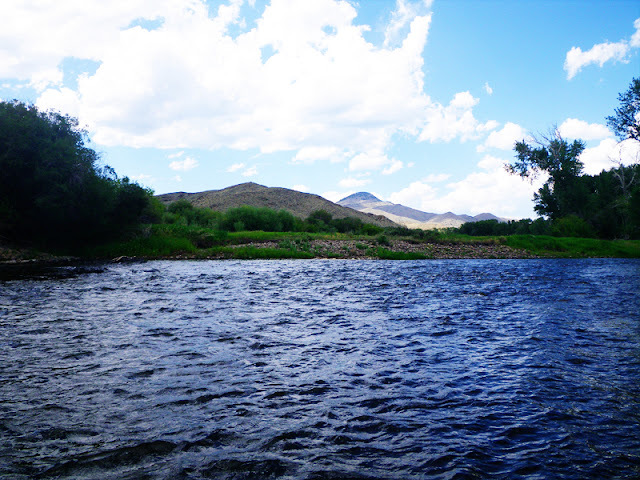 The Big Hole river is a beautiful river with weaving braided sections and an upper rocky canyon. It reminds me of the Falls River in Idaho, only it has brown trout and grayling too. I kept working my way down to the other bridge. Fortunately the thunder storm rolled by without incident. One thing about this river, and it is something I tend to forget about fishing in general, is that the holding water can be anywhere. Shallow water can hold big fish! One particular shallow but fishy looking run taught me this lesson once more. I casted up stream and after a short float my hoppicator shot under. I set the hook and ZING! The fish took off and fought hard enough for me to think it was foul hooked. I was shocked to see just how respectable this brown was. 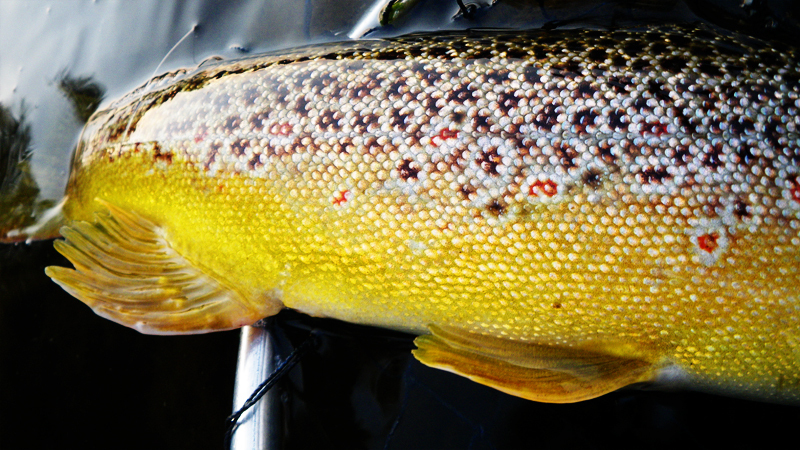 My love for Montana fishing was galvanized... that didn't take long. I made it back to the bridge without touching another fish and hoofed it back to the truck with the intention of heading up into the canyon. I wanted to find cooler water. 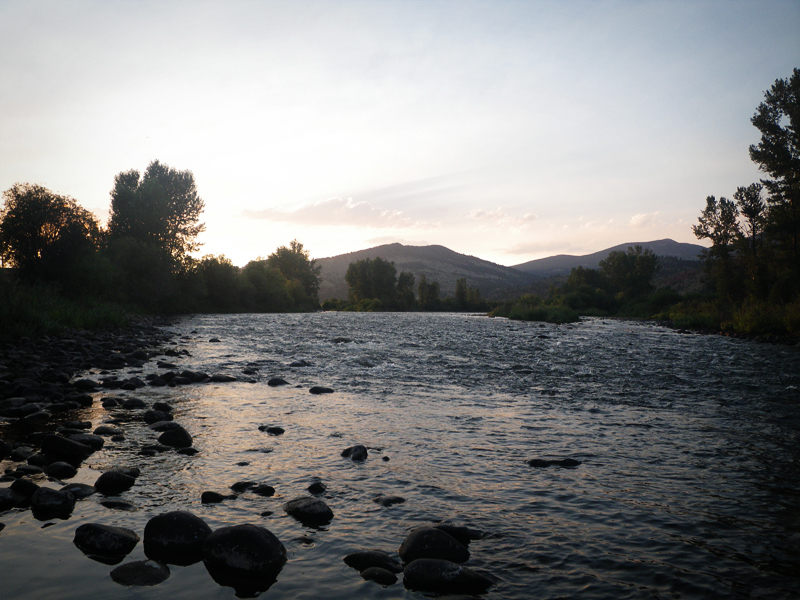 It was hard to keep driving along the river as I saw a lot of potentially fishy water but I persevered and headed to the suggested location. Once there I decided to tie on a heavily weighted leech/stone variation that my good friend Shane had introduced me too. I put on the same hot-wire hares ear nymph to trail it. From here on out it was all about the swing. It's a bit of a trick to get the feel of a successful swing, but when you can the rewards are great. Cast upstream, get your flies down low, keep sensitivity tension, and then let her swing. The real trick is keeping the sensitivity tension while the line comes downstream to you, and then keeping your bugs on the bottom for the swing. You gotta love when you make a good cast and KNOW it is a good cast. Nine out of ten times you can expect the BAM! 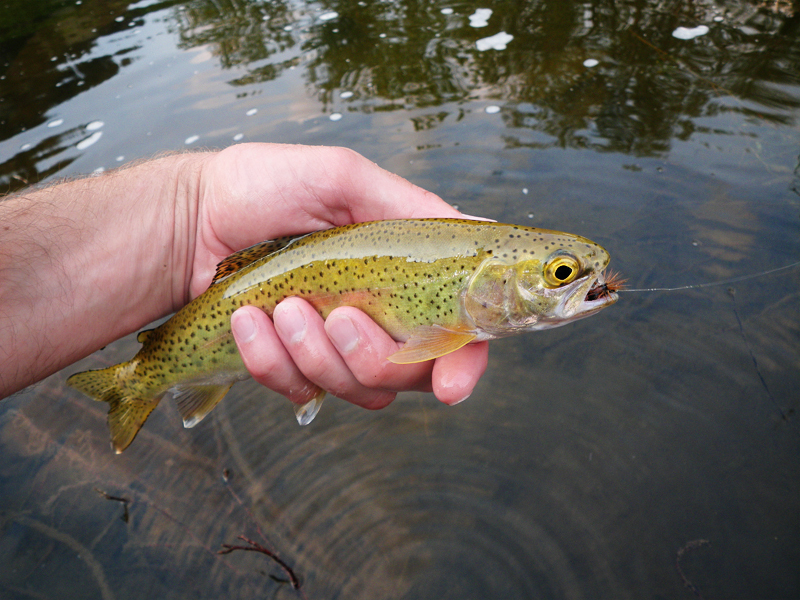 This particular method allows you to fish the water that most other fisherman pass up. 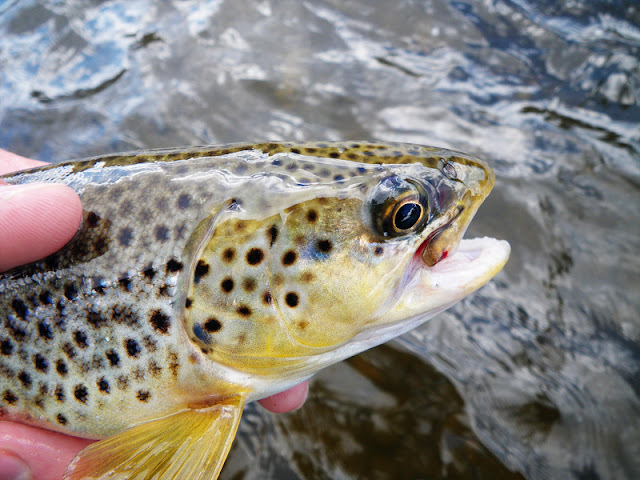 The water that is faster, more choppy, produces more oxygen, and as a result holds fish. Don't pass it, or you will miss out. Learn to feel the tension and swing through the zone and you will be pleasantly rewarded. I made some friends on the river. This little guy blended right in with the rocks. He was having his dinner whilst enjoying the show. 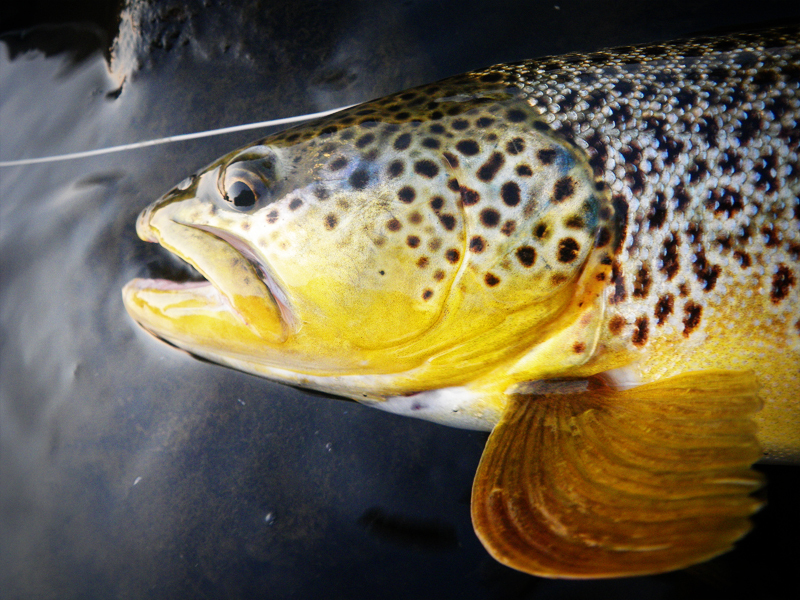 The evening rolled around and a tough decision presented itself, streamers or dries. Fish were rolling all over. 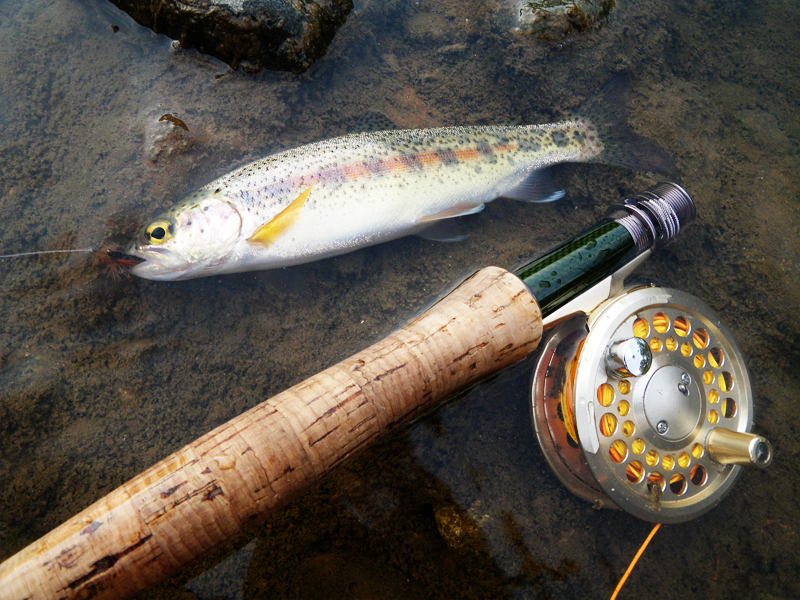 I hightailed it back to the truck, rigged up the 3wt with a caddis and rusty spinner, and made my way back to the river with two rods in hand. It was a good decision. Fish after fish plucked the rusty spinner from the surface. Most were feisty bows that rarely reached the 12 inch mark. After I had my fill of catching on dries and the light was too low to detect takes I broke out the big guns again. 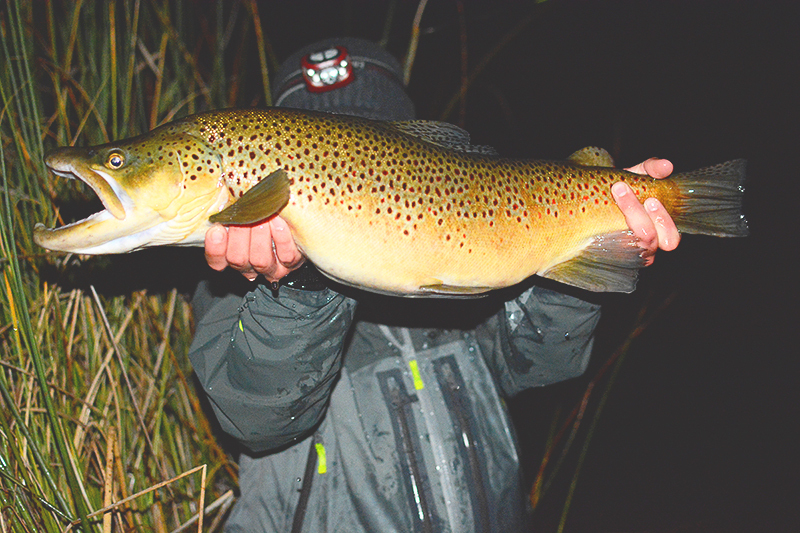 Two casts in with the large black streamer and the line was hammered. This 14-15 incher fought great and was beautiful! 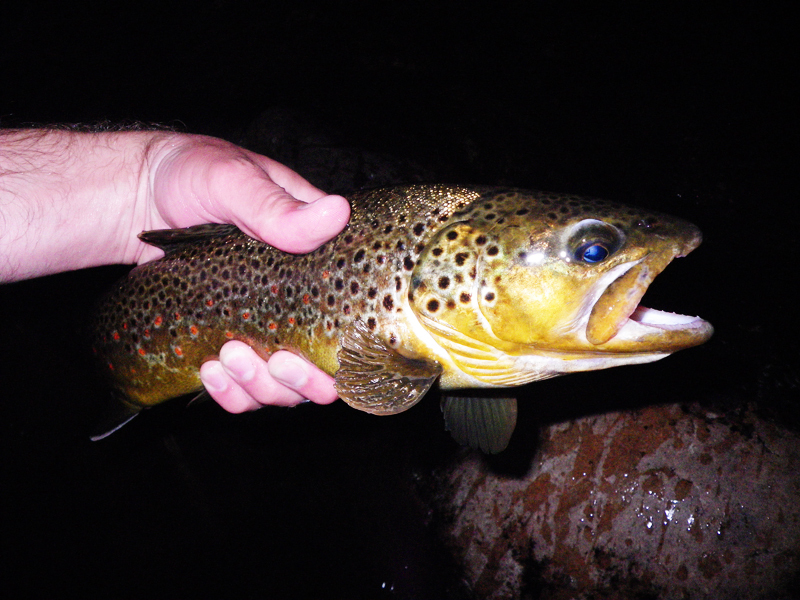 The dark made it difficult to catch how pretty this fish was. After that I decided to head out. Throwing articulated setups in the dark can be pretty freaky, especially without protective glasses. 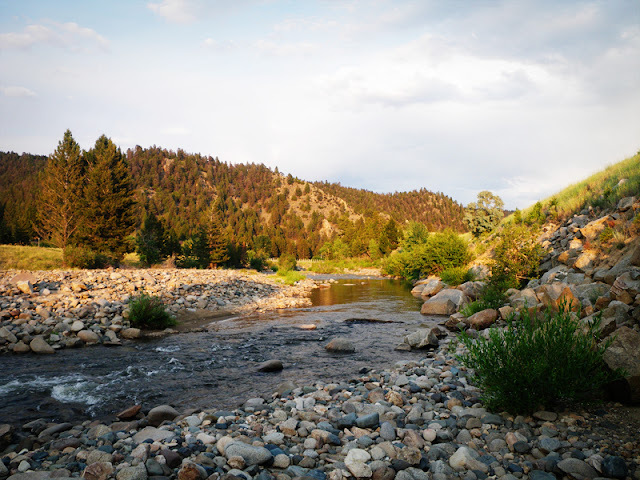 The next day I was routed to Helena and I thought I might have time in the evening to hit up the Boulder River on my way back to Butte. The fates aligned and I found myself parked beside a beautiful stream-like river littered with large stones and boulders. It was full of willing little bows and an occasional brookie. 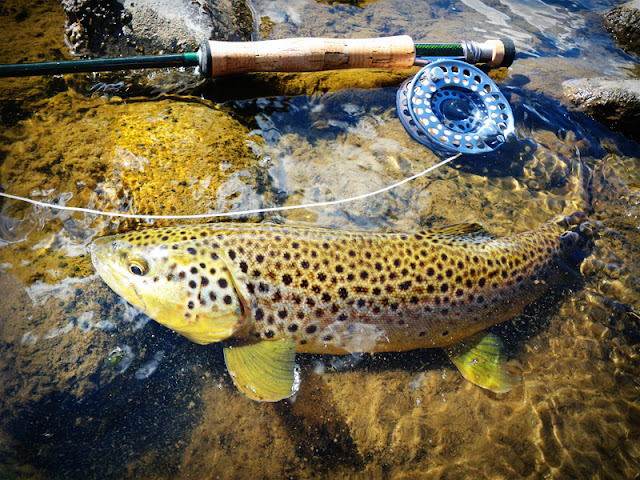 Give me a 3wt rod, dry fly, and gorgeous river like this and I am a happy man. This guy was an odd greenish yellow and had huge eyes. I'll chalk it up to the local mining. I wish I could have gotten a better picture of this brookie. It was beautiful, but it was dark by this time and it was a wiggly bugger. The next day I was routed in Butte and found myself done around 6pm. The Big Hole River was calling my name so I hustled back to the hotel to grab my gear. I was on the water about 7:30pm. This time I made sure I had bug spray. (My first trip I was eaten alive. It was a kind of mosquito acupuncture!) I re-rigged both the 3wt and 8wt. 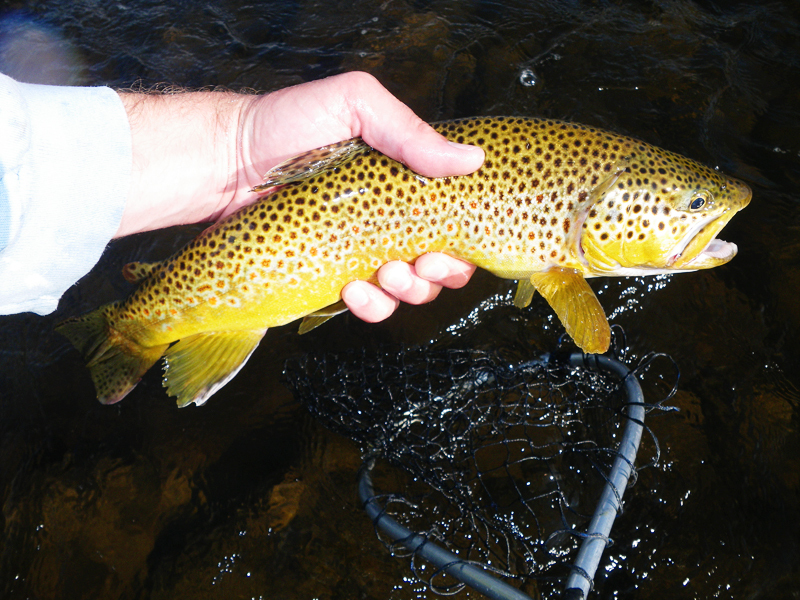 This time I put on a larger black streamer, hoping for a hungry brown. 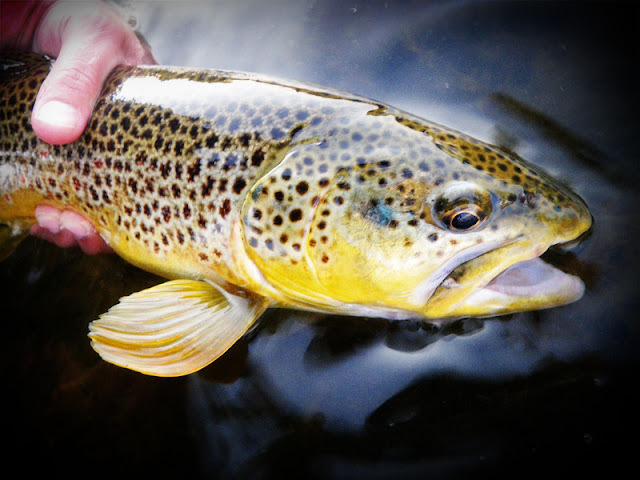 The nymphing water was a bit of a walk and time was short so I threw the 3wt for a bit just waiting for the magic hour. During the wait I picked up a couple spunky dinks. Right as the sun started to go down I busted out the meat. Second cast in I let the articulated offering sink down a bit, followed by a slow and steady retrieve. The third strip in the fly was hammered. 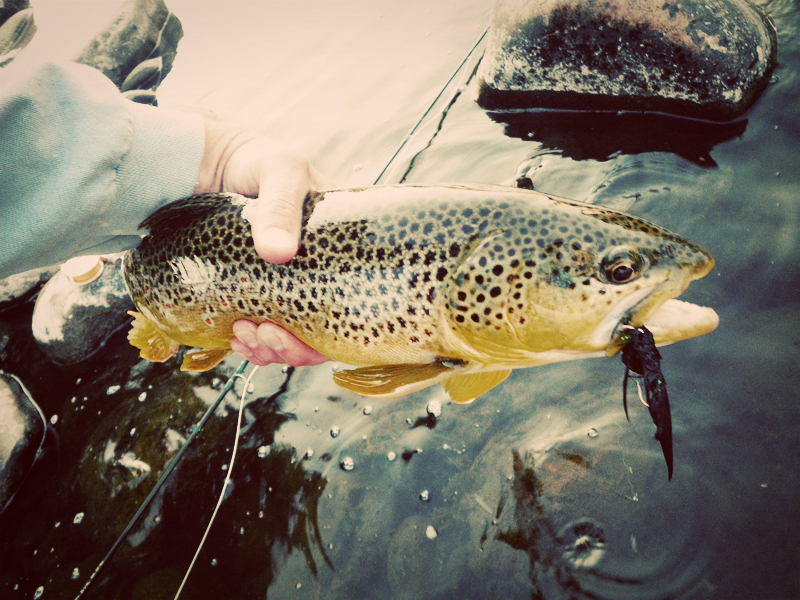 It was a beautiful healthy brown. Right after the hook-set I'm sure the residents living close by were unnerved by my victory howl. 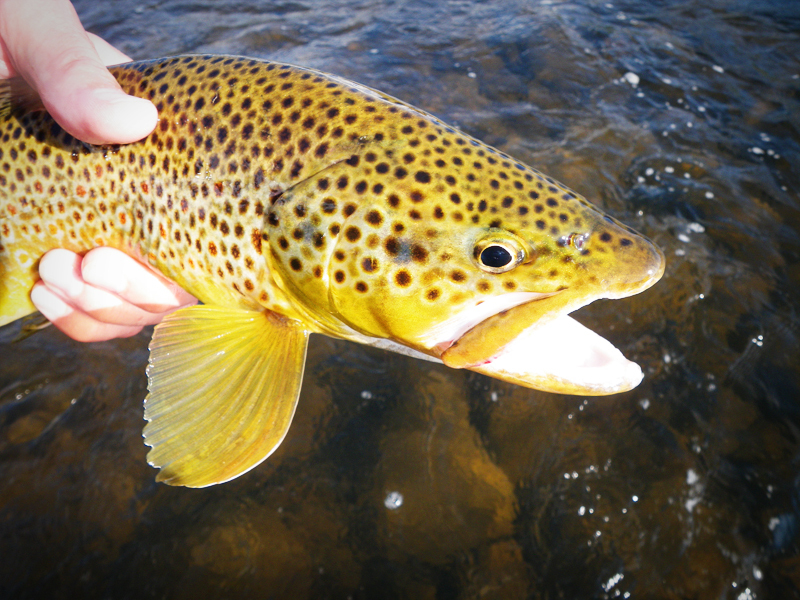 No more takers came on the streamer so I went back to the dries for some more little guys. It was another great Montana evening. The next day I hit the Boulder River for about 45 minutes, on my way back to the hotel. The only reason I did not fish longer is that I was in a hurry to get back home to my family and had planned on driving back to Idaho that evening. 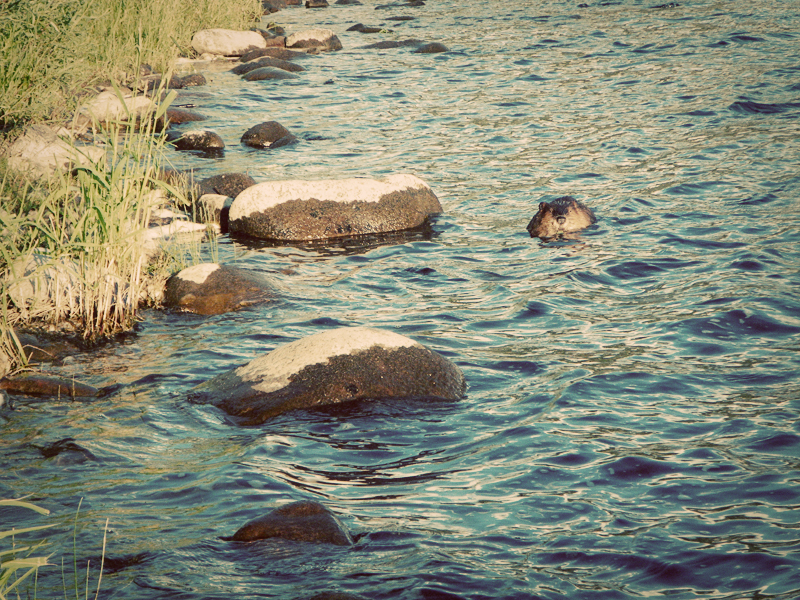 Montana has some beautiful water and I only saw the very tip of the iceberg. There may be another trip up there in a week, and if there is you can be assured I'll be mixing business with pleasure. Great write up Chris and beautiful pictures as usual. Love those Browns.